Today I will provide you complete information about the civil aviation authority's job. 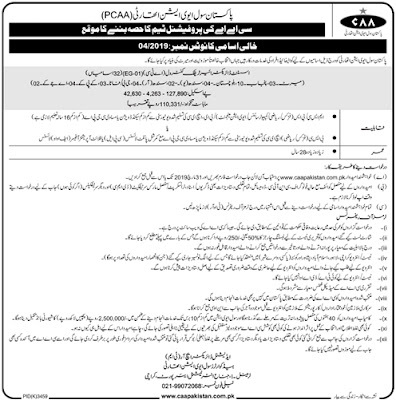 The new vacancies have been announced in March 2019 by the Pakistan Civil Aviation Authority. The best opportunity to make part of the professional team of Pakistan Civil Aviation Authority. All candidates are instructed to read the advertisement before apply. The appointment of all the candidates will be on the quality of medical fitness. The selected candidates can be posted anywhere on the basis of the wishes of the Pakistan Civil Aviation Authority. MSc/BS Physics, Math, Computer science and a minimum of 16 years of education. You must be older than 28 years old. How to apply for CAA Jobs 2019?